Forums » General Discussion » Home Theater » Loving My M60s Even More Nearly 8 Years On! #429667 - 07/18/18 05:03 PM Loving My M60s Even More Nearly 8 Years On! I've had a pair of M60v3 towers since Nov. of 2010 ($1040 from the factory outlet at the time) and a VP100 center. I love them dearly and wouldn't think of replacing them with anything else. They're just the standard black oak vinyl finish and still look brand new. Nothing peeling or looking the slightest bit ragged. Not that I haven't been tempted at times to try something different but that temptation has always faded once I did some research. For example, the Golden Ear Triton 7 looks interesting - but that full body sock would not be compatible with my cats. Others at the $1500/pair price point don't have non-parallel surface cabinets etc. I would like to hear one of those folded ribbon tweeters that are so popular now at some point but the highs from the Axiom aluminum dome isn't harsh and has excellent dispersion and imaging to my ear. On a technical note, there's something to be said for a speaker company that builds its own drivers. Why have a crossover that's more complicated than it needs to be? When you have full control over the driver design you can take advantage of a given driver's natural roll-offs. In my opinion this crossover simplicity and control over the drivers leads to more transparent sound, not less. I just upgraded my Denon AVR from a 3808ci circa 2008 to an X3400H. I never cared for the older Audyssey room EQ system in the 3808 and the Axioms sounded pretty darn good on their own (with a sub crossed over at 80Hz and a parametric EQ in the sub line to get rid of a big bass room mode). The X3400H has the latest and best Audyssey XT32 and, thanks to the Audyssey threads over at AVS, I gave it a try. Wow! Running XT32 with all 8 mic positions closely spaced only around the MLP worked very well. 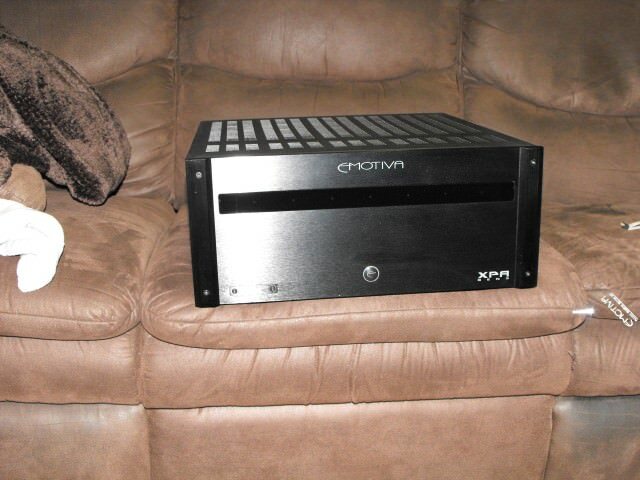 The Axioms sound better than ever now without losing their natual sound, especially the small VP100 center! I previously found myself wishing I could fit a VP160 (or even a VP160 Mini) into my system but alas there's simply no way it would fit without major modifications or replacement to my system rack/ TV stand. Even then the TV would probably have to be too high and there's no wall to mount it to behind. I never had any issues with the VP100 not being able to play loud enough, it just never sounded "full" enough - kinda thin if you will and not blending with the rest of the system as much as I would have liked. What the Audyssey XT32 was able to do with that VP100 in my room is nothing short of amazing. Dialog is now sounds full and clear enough that I am no longer wishing for a bigger center (even though that VP160 looks awesome). It blends with the rest of the system much better. Note that I have cross-posted a version of the above on the AVS speakers forum. There's way too much neglect and misunderstanding of Axiom over there. XT32 is amazing and I'm very fortunate to have it in a $700 receiver. I recommend you calibrate within the area bounded by your speakers and not just around the MLP. Yes indeed. I actually paid slightly less than that for my X3400H. Been there, done that. Confining the measurement area to around the MLP made all the difference for me in this crazy room. Still doesn't sound bad in the other couple of seats.